Less is more at this award-winning glamping site on the edge of Dartmoor, where just two yurts occupy no less than 18 pristine acres of prime Devon farmland on the Devon side of the lush Tamar Valley, which forms the border between Cornwall and Devon. Situated on the northwestern fringe of the National Park, the views of Dartmoor from both yurts (named Little Links and Great Links) are stunning, and they both have their own private paddock and freshwater wood-fired hot tub to enjoy them from. 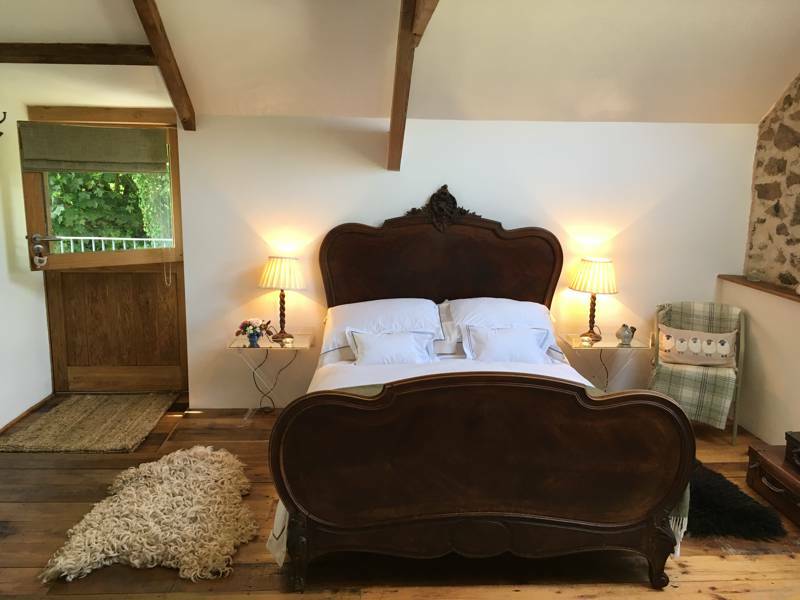 Inside, each has a wood-burning stove, rugs and sheepskins to keep you warm, beds are made up with crisp cotton linen, and they also have their own loo, sink and kitchen, helpfully stocked with tea, coffee, sugar, milk, condiments and olive oil. Those features aside, the two yurts are quite different from each other. Great links is a whopping 21 foot diameter and is in an elevated meadow, a short walk along a solar lit path from the shower barn facilities, look out for the bats flying overhead and enjoy the clear night skies. Little Links at 18 foot diameter is a romantic retreat suited for couples or those with younger children, the romantic wood fired roll top bath is just footsteps away, it is closer to the shower room facilities shared by both yurts, which includes a wet room styled rain head shower overlooking Dartmoor and a separate loo as well as refrigeration and washing and drying facilities. Devon Yurt really have thought of everything! Whichever yurt suits you, it’s the little things that makes glamping at Devon Yurt special: the elderflower cordial waiting for you on arrival, the fire ready-prepared, freshly laid eggs for breakfast, the veg and herb garden and home-baked rainy-day cakes. You share Borough Farm with gorgeous rare breed sheep, connemara ponies, pretty chickens and ducks and countless wildlife. 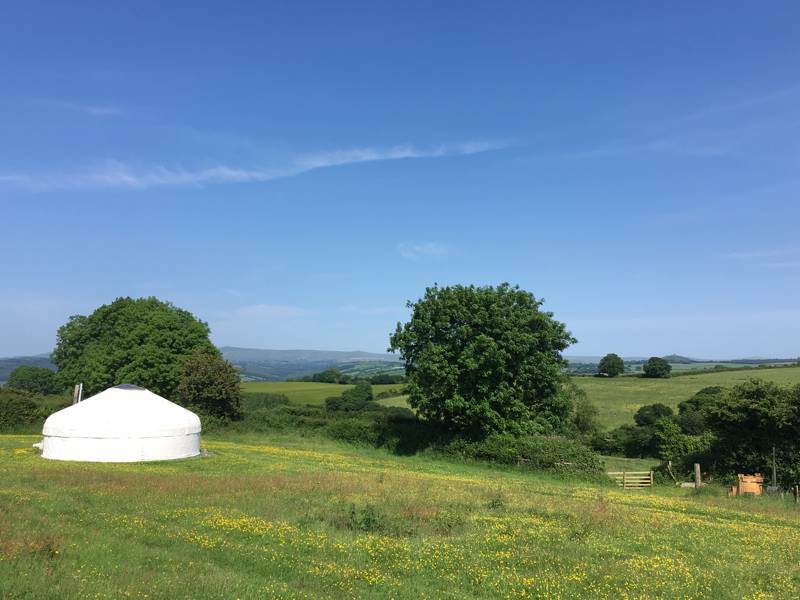 Definitely one of our favourite yurt-glamping sites in Devon, (or, er, anywhere) – and if glamping isn't your thing, they also run a superb B&B on the same site. Here at Multi award winning Devon Yurt we are passionate about many things. Firstly, our landscape, our stunning views towards Dartmoor from the farm.These views are what inspired us to start our glamping business here many moons ago.This is what gives our site its WOW factor! Secondly, we value the peace and quiet of this location and we are proud to announce that we are probably one of the least densely populated camp sites in the country ! Here on our 18 acres of nature friendly farmland, it is just ourselves, yourselves and our animals. We have just two award winning yurts, each set in their own meadow with their own fire pits and outdoor eating area where you are free to soak up the great outdoors without interruption from fellow campers, allowing you - our valued guests, all important space and privacy. We wouldn't want to camp in a field filled with other guests so we don't expect our guests to do so either! Each yurt has a wonderful log fired, fresh water hot tub, for its own private use. Next, we are passionate about our domestic animals, our chickens – you can collect your own eggs from the hen houses! – our rare breed Devon and Cornwall Longwool sheep which you can help feed, our new flock of stunning Zwartbles sheep and our Connemara ponies which you may see being prepared for the local shows in the Summer and our fox red labrador, Archie, who is always happy to welcome new guests ! Last, but not least, we are passionate about sharing this hidden corner of the world with you, about making your holiday truly memorable and providing you with a retreat from our all too often frantic lives, making your holiday truly relaxing and enjoyable. Increasingly Devon Yurt guests arrive and don't want to go anywhere else, one inspector last year wrote " the silence was magical, I could imagine arriving at this site and not leaving until the holiday had ended " however, if you do want to go out and about , Devon Yurt are lucky enough to be in striking distance of some truly magical places. 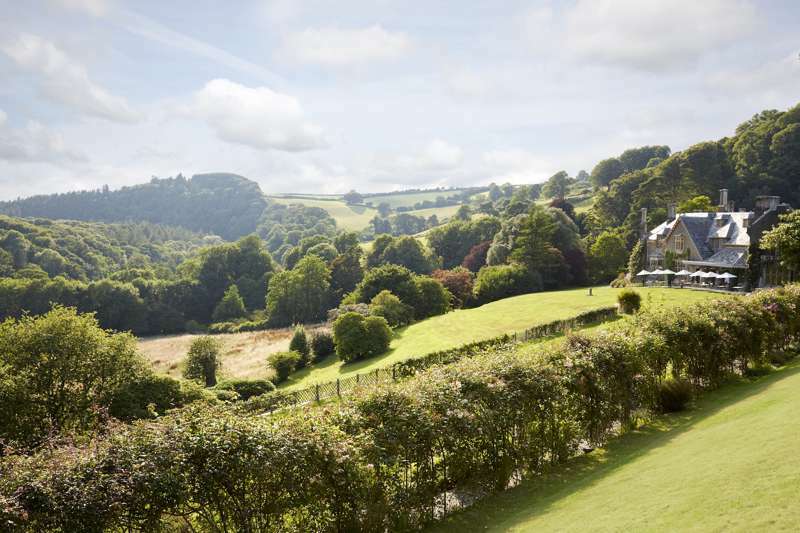 The peace and quiet of the Tamar Valley, and area of outstanding natural beauty, which offers cycling, walking, canoeing and even tree surfing ! is quite literally on the doorstep. The stunning north Cornwall coast, rugged and naturally beautiful with fantastic walking, surfing and rock pooling is just 30 min away. The natural wildness of Dartmoor with its wonderfully rugged terrain, offering great riding, cycling, walking and wild swimming not to mention wonderful pubs to refresh yourselves with delicious locally sourced food, just five minutes by car. Devon Yurt can provide details of all the surrounding nearby beaches such as Widemouth Bay and Bude, lakes, rivers and top walking spots, not to mention secret plunge pools and wonderful dog walks. Dartmoor is one of the biggest attractions, but there’s much more than walking and wild swimming on the doorstep. Go horse riding over the moors with Cholwell Riding Stables at Mary Tavy (01822 810526), or award winning Liberty trails. Swing through the Tamar Valley woodland on a high ropes course (01822 833409). Also at Gunnislake, there are 25 miles of family-friendly cycle trails (bike hire available), and freewheeling fans have also got the disused railway track of the Tarka Trail nearby. Route 27 cycle track, the granite way and the drakes trail. Families can also make the most of the natural environment at Lydford Gorge, where a walk to the waterfall (accessible buggy route) is complete with all the National Trust trimmings, including a café and picnic area. The famous Eden Project (01726 811911) is really close by too ! We are 'foodies'. In June, we make our own elderflower cordial which we give to you as your arrival drink. We grow our own fruit and vegetables which are available for you to purchase from our 'shop'. Our gorgeous free range chickens lay the most fantastic eggs which we can prepare for you for breakfast, delivered to your door in a hamper with other delicious early morning goodies! Fresh seasonal produce including vegetables, fruit, salad and free-range eggs are available on site, and you can help yourself to herbs from the kitchen garden. Beyond Julia’s excellent home-baked cakes and elderflower cordial, Lifton Farm Shop (01566 784605) is the place to go for the very best local goodies . For eating out with kids in tow, a couple of the best pubs in the area include the Dartmoor Inn at Lydford (01822 820221; www.dartmoorinn.com) and the Blacksmiths Arms at Lamerton (01822 612962). 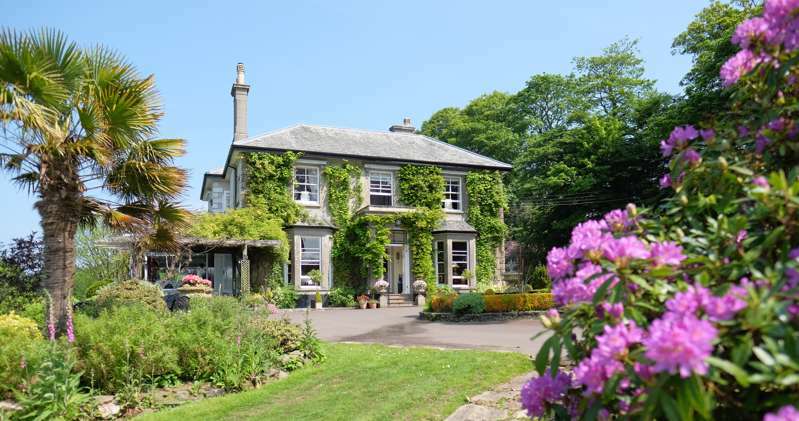 For traditional Devon pub grub, check out the Elephant’s Nest (01822 810273). plus the award winning Cornish Arms in Tavistock. Farm animals include hens, sheep, chicks, duck and ponies, plus there’s a ride-on tractor for kids. There are blackberries to pick in season and a range of indoor games for rainy days including table tennis and swing ball. You can even collect your own eggs from the hen houses for a delicious breakfast ! It doesnt get much better than that ! Two yurts (Little Links sleeps up to 2 adults and 2 children; Great Links sleeps up to 2 adults and 4 children) decked out with dreamy double beds, Great Links also has a french day bed, roll-out futons, table and chairs, cutlery, crockery and lanterns. As well as outdoor seating, a Belfast sink and a campfire/ barbecue area for each yurt, gas stoves are provided. A separate bath tent houses a wood-fired bath tub and the shower house has a wetroom-style shower where you can shower overlooking Dartmoor, flushing toilet, laundry facilities, a maytag fridge freezer - perfect for ice creams and cooling drinks and there is even a separate indoor games barn where you will find guide books, novels to share, board games, maps and local information, plus of course you have your very own log fired hot tub ! Two yurts – Little Links, sleepingup to 2 adults and 2 small children, and Great Links, which sleeps up to 2 adults and 4 children. £385 for four nights in Little Links & weekly prices from £750 to £870 in Great Links. Exit the A30 at Lifton and continue through the village, past the Arundell Arms on your left, and over a bridge at the bottom of the hill. Turn right, signposted ‘Chillaton/industrial estate’, and follow this road up the hill for a couple of miles to the crossroads called Borough Cross signposted to Kelly. Do not turn off but continue for 50 metres and you will find Borough Farm on the left-hand side. Bere Alston is the closest rail station. Alternatively you can catch a train to Exeter and then get a bus to Lifton, but if you want to explore Dartmoor and all its surroundings then this isn’t the place to be without your own vehicle. Take cover at Barn Climbing in Milton Abbot (01822 870521) with indoor climbing walls surrounding a huge boulder and excellent instructors. There’s plenty of indoor fun to be had at Trethorne Leisure Farm (01566 86324) near Launceston, with all sorts of activities from a soft play area and slides to trampolines and an assault course.